As one of the most sought after pure palladium coins available, the Canadian Maple Leaf Palladium Coin is a treasure to own. The Palladium Maple Leaf was only minted through certain years, making it highly desirable amongst collectors and investors. The Royal Canadian Mint produced these coins from 2005 to 2007 and also in 2009. Consisting of .9995 pure palladium, this coin is one of the most recognized palladium bullion coins in the world today. Obverse: Canada’s national symbol, the maple leaf. Across the top of the coin “Canada” is proudly displayed with the words “Fine Palladium 1 oz Palladium Pur” rounding out the bottom. Reverse: A portrait of Queen Elizabeth II, and the year in which the coin was minted. Other than the uniqueness and sheer brilliance of this coin, there are even more compelling reasons investors and collectors choose to make this coin a part of their collections. Palladium itself is a valuable precious metal to own and over the past ten years it has increased in value, making it highly desirable amongst investors and collectors alike. Because of its price point, palladium is a fantastic precious metal to begin investing in. Palladium’s spot price typically stays at a midpoint between that of silver and gold. For investors who want to begin understanding the precious metals market, this price point makes it easy to begin collecting and learning more about the factors that affect the price of bullion. 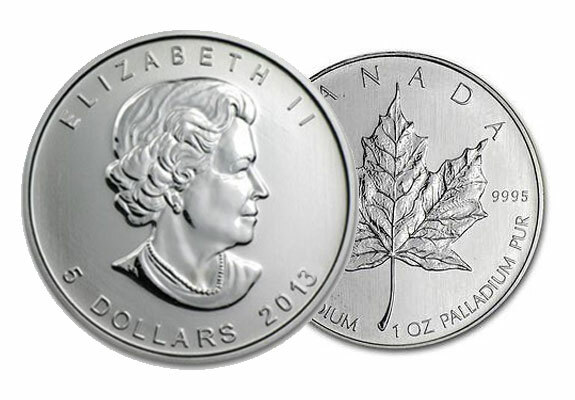 To add Canadian Maple Leaf Palladium Coins to your existing IRA, former 401(k), or Precious Metals IRA, or make a cash purchase for direct delivery, contact American Bullion toll free at 1-800-326-9598 to speak with a specialist.